When you are starting up a business, it’s a good idea to keep overheads to a minimum, stick to a budget and not overstretch yourself financially. 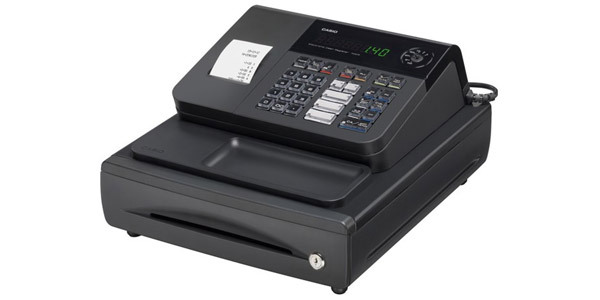 We offer a wide range of affordable cash tills but our best offer is for the CASIO SEG1 at less than £60. We feel this is the perfect choice for a start up, you can’t get much cheaper than that! The entry level CASIO SEG1 is ideal for simple operation. It comes with 8 separate departments which can be used to record all sales for separate categories of product. The operator can input all sales in a salon environment to say, shampoos in department 1, ladies hair cuts in department 2, mens hair cuts department 3, hair colouring into 4 and so on. Making it much easier, quicker and more organised. At any time an X reading can be taken and this will print out the total amount of revenue taken in each department. It also give you the total sales revenue. As this is an X reading the machine will retain this information. This machine is ideal for any retail situation where you wish to have a breakdown of such information. You may take as many X readings as you wish, and the totals will accumulate. As and when you wish to finalise and clear everything simply take a Z reading which will show the grand total and return the readings to zero ready for the next day’s transactions. 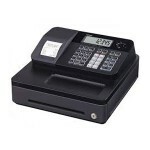 This till also records, cash and card payments and splits the totals of each on the readings. Change can be calculated easily by the cash register by simply pressing the Sub Total button. The total price and then the amount of change being given is displayed on both the operator and customer display. This model probably has the smallest footprint of any till currently available, Dimensions: 325w x 345d x 167h mm, and a small drawer accommodating 5 coin and 3 note compartments. A keyboard cover can be supplied, which may be useful if you are working in an area where liquid spillage, dust, or crumbs may be an issue. The CASIO SES 10 has a normal sized drawer with 8 coin and 5 note compartments. It also has the facility to run an audit roll, or issue receipts permanently, or only when requested by the customer. This feature is very popular with retailers, giving the option to save using up unnecessary amounts of till roll. This model comes with double-sided display, is single roll, and also comes with electronic journal feature. 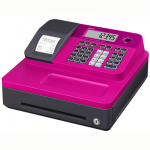 Also comes with usual functions such as X reads, Z reads, % button, sub total and change feature, 5 separate category departments, green double-sided display, overall machine is black in colour. Lockable cash drawer.